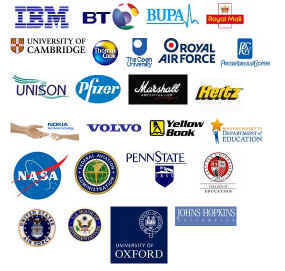 Our IT training materials are used by thousands of organisations in over 80 countries. See more clients. Our IT training materials are used by thousands of organisations in over 80 countries. Cheltenham Courseware has donated almost £100,000 to charities. “I stumbled across your courseware while desperately searching for decent training manuals for our Computer Training Organisation. The feedback regarding Cheltenham training manuals has been excellent. Students have found them easy to follow, clear to read and very helpful. On our part, having good training manuals is essential to our business. Working with such good materials makes the trainer’s job so much easier. The additional resources that you supply are put to good use by trainers and student. As any training organisation will know good manuals are essential to student learning, customer satisfaction and more demand for WESTN training. Our IT courseware may be purchased on a site license basis, with a one-off payment allowing you to print as many copies as you require. Now check out our courses!